“I decided to do the My FirstFondo clinic because I was very new to the sport of cycling. Although a welcome challenge, the thought of riding my bicycle to Whistler was quite intimidating. I wanted to become more confident riding on roads, be able to climb hills efficiently, and to be comfortable riding in groups. 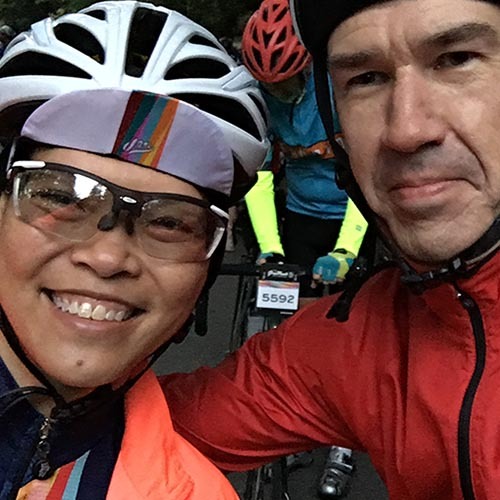 “I joked with my clinic leader, Brad, on our last ride before the RBC GranFondo Whistler, “they should really call this ‘Zero to Fondo in 12 Weeks’!” We laughed, but I reflected on that ride how true this rang for my training experience. I’ve never considered myself an athlete by any means, I mostly exercised to be able to eat and drink what I wanted. I had hired a personal trainer and found myself decently strong, but my cardio condition was embarrassing, to say the least – so I was tasked to run for 3 km without stopping. Setting a fitness goal, working towards it, and conquering it were three completely new additions to my vocabulary. In the spring of last year, I ran my first 5 km race, then my first 10 km, then pushed myself to my first half marathon in June. These were all things I never believed I could do. After the half marathon, I felt out of fitness goals. My mum had signed up for RBC GranFondo Whistler; I was a hard “no” and sure this would be way too difficult for a beginner cyclist – I didn’t even have a bike that would take me to Whistler. This all changed following the information at the My FirstFondo Kick-Off night, I had taken the plunge after meeting my future clinic lead, Brad, and speaking with several veteran Fondo riders. I upgraded my bike and jumped right in. The My FirstFondo clinic turned out to be exactly what I needed to prepare myself for RBC GranFondo Whistler. My training group was full of other first-timers, who I found had a lot of the same “can I do this?” nerves as I did. We learned to corner, hill climb, signal, change a flat, and be efficient in our movements. We sweat, we laughed, our legs burned, some of us fell over, and we all completed the RBC GranFondo Whistler. I crossed the finish line alongside my mum, and experienced my most memorable finish-line-feeling yet. “Let me start by saying that I’m not a road biker, or biker at all. I learned to bike when I was 40 years old, I’m 48 years old now but last year was the first time doing anything over 20 km on a bike. One of my bucket list items was to do the RBC GranFondo Whistler before I turned 50 years old. I was doing a lot of spin classes and many of my fellow spinners were road cyclists and talked about the joys of doing a Fondo. I signed up for a My FirstFondo training clinic with my husband who is an excellent biker, but came with me for moral support. The first class was a real eye opener. My instructor, Brad Hughes, wanted to access our abilities so we went on an easy 20 km around Mount Seymour Parkway… All my insecurities of riding, being around cars, flared up and had a panic attack. The instructors were so kind and one of them would always be with me till the end of the ride. Needless to say, every class after that was another struggle of learning, beating down my demons, but with each class as well, I could see improvement. With the encouragement of Brad and the others in the class, students as well as the instructors, I started using clip in peddles, we did a climb up Cypress Mountain and each of the instructors would check in on all of us to make sure we were ok. Our My FirstFondo group really bonded together. We talked about our training, group rides, the ups and downs. Signups close Monday June 11. Let’s do this!